Families looking for North Dakota colleges should start with the College Planning Center which is sponsored by the Bank of North Dakota. The site has all the expected information for students starting their college search including a basic description of how the process works and links to financial aid resources. The website provides links to other useful sites such as Crash Course which is a free program for students in grades 7-12 and their families to learn about college financial planning. You can register for an event at the website. The RUReadyND.com website allows registered users to create a portfolio, view career information, search for colleges, and develop a career plan. Students can also prepare for tests with the Test Prep section and apply to colleges. The website also allows users to practice completing a college application. Students planning on starting at a community college should visit the North Dakota University System for information on Articulation Agreements and General Education Requirements Transfer Agreement. The site also has information on student exchange/reciprocity programs available to North Dakota residents. There are nine four-year North Dakota colleges with 500 or more full-time undergraduates according to the Integrated Post-secondary Education Data System. Approximately nine percent of students attend one of the two private Dakota colleges while 91% of students attend one of the seven state institutions. 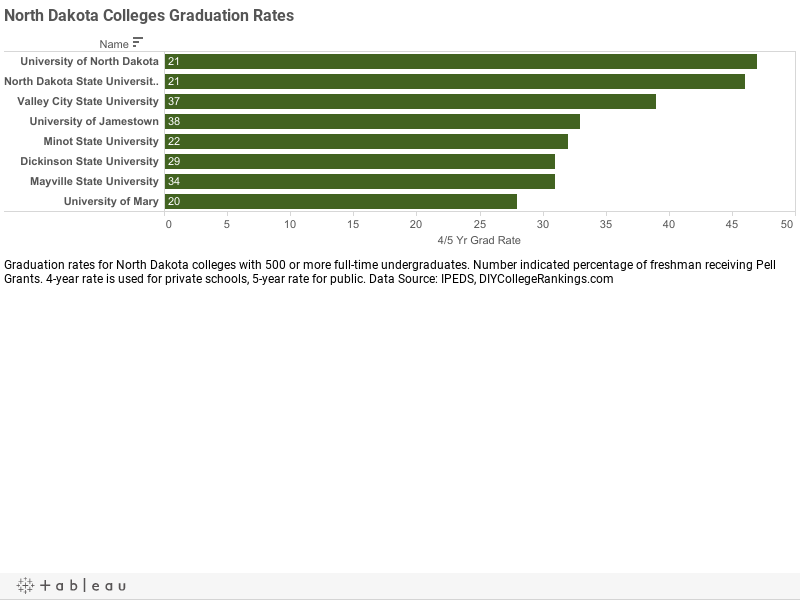 The private North Dakota colleges have an average four-year graduation rate of 30.5% and the public universities have an average five-year graduation rate of 37.7%. No North Dakota colleges meet the DIY College Rankings 50-50 profile requirements. College-bound seniors in North Dakota had an average of 20.6 ACT Composite score with a 19.6 for English and 20.7 for Math. The 75th Percentile scores were a Composite of 24, 23 for English, and 24 for Math. A total of five colleges ACT 75th% Composite scores were at or above this level.